Reminiscence therapy is a positive pastime for people with dementia and there is evidence to suggest that it is helpful in improving overall psychological wellbeing and preventing further psychological deterioration. 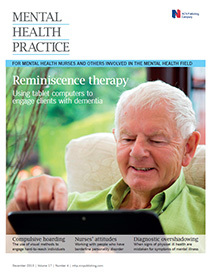 This article outlines a project on the use of new technology in reminiscence therapy in dementia care inpatient settings, which uses a tablet device to store a reminiscence file for individual patients. These files include visual material, such as photographs and films, as well as a playlist of songs and music that are significant to the person. Sessions using the tools are being evaluated against more traditional methods of reminiscence therapy.